I've been absolutely HORRIBLE keeping up with my weekly LOVE IS... Posts! :( Soooo Sorry! Seems like when hump-day rolls around I always have SOMETHING ELSE TO SAY! This is sooooo my life! Ugh! I really had to do some digging to track down this charming little Clipping! I KNEW I'd find at least ONE Halloween LOVE IS Cartoon tucked inside one of the old LOVE LETTERS my Mr. AGPMan use to send to me while dating...and I was right! I found ONE! Sent to me October 22, 1977... (Wow! I was YOUNG then!!!!). My guy has always been sweet and bought little treats for me on Halloween. I know it sounds crazy but I sorta like rot-gut candy. :) Not all of it (like the horrid bubblegum I mentioned yesterday! ), but some I LOVE! Like Abba Zabba's (which are no where NEARLY as good as they use to be!) and Big Hunks~those little babies will rip out your teeth if you're not careful!). My very favorite Candy is SEE'S! Can't pass on a Bordeaux Bar...Nope! No-can-do! Since I'm on Weight Watchers I won't be indulging in ANYTHING this year. Save for the Latte Ice Cream Bar that has ONE MEASLY LITTLE POINT! Anyway, inside the same letter I also found the LOVE IS... Clipping below! 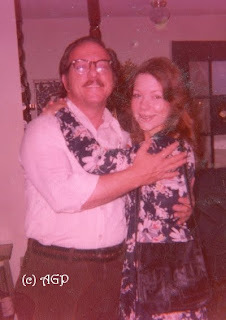 My guy learned EARLY ON while dating this hard headed gal of his that SHE DID NOT THEN and DOES NOT NOW, LIKE SCARY MOVIES! I've seen a few...enough to know that my life has now been cut short as a result of indulging in such behavior. I couldn't even handle Jurassic Park! OMGOSH... I still have flashbacks of sitting in the movie theater with my young teenage son and embarrassing him with my LOUD, out of control SCREAMS! He still speaks of this to this day... I personally think it was HIS FAULT for dragging me there! I'll take Sense and Sensibility any day to the horror flicks! Enjoy the little children who come visiting tonight! I'll be dressing up Miss K and I'll share pictures with you after she leaves with her Momma and Daddy! 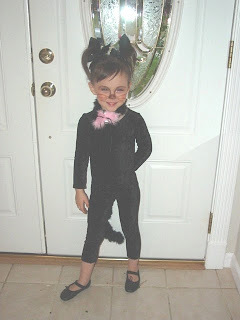 Dressing up our sweet Miss K as a Kitty Cat in 2007 proved to be a truly hysterical experience. She is sooo thin that I struggled to find anything that would fit her around the waist and then be long enough for her bony legs. Trick or Treating was fairly warm that year in Oklahoma and she got away with wearing exactly what she has on here...a black, lightweight velour body suit (courtesy of our local thrift store) and brand new black leggings. Black Marabou for her tail and felt triangles for her ears got me off REALLY cheap! The ballet shoes she has on she had just worn to her Auntie Adrie's wedding! Figured she'd better get some use out of them before her little feet outgrew them! Wearing BLACK AGAIN wasn't planned, it just happened! 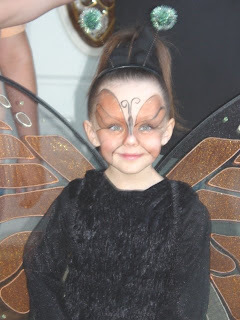 That year I slicked her hair up off of her face because I wanted to ATTEMPT my hand at some face painting! Argh! What a mess! Still, she ended up looking sooooo exotic with her greenish blue eyes peeking out from all that makeup! Even with he topknot on her head, look at how much she grew in only one year! At least three or four inches. She's going to be a TALL GIRL! I do believe it's going to be a COLD and possibly WET Halloween this year! :( Miss K's going to be a 50's Girl because I want her to wear the pink poodle skirt I recently made her for a Sock Hop at her school ( I showed it to you a few weeks back). Even though you've already seen it I'll be sure to snap a few new pics so you can see once more just how much she's grown since last year! Wasn't that hard bubblegum terrible? I could never figure that stuff out! 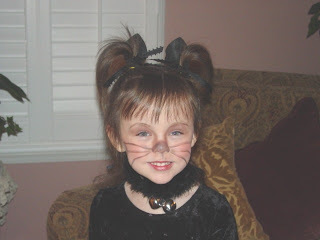 When my children were itty bitty I loved to dress them up for Trick or Treating. In our home witches and goblins weren't allowed...nor anything else that was SCARY, bloody or creepy. Sorry! Not for this girly girl! 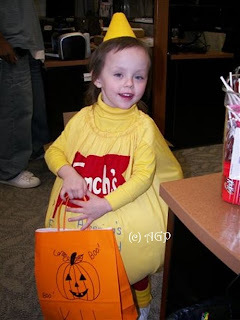 We kept the rules fairly simple regarding Halloween Costumes and in the end we have some wonderful, sweet memories that relate to them gathering up bags full of candy. 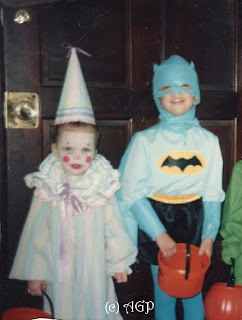 In 1987 my son Brandon was Batman! Yes, "The Caped Crusader" himself! The only problem was that he was BONE THIN (no muscles at age 5!) and he insisted the costume be made in the exact colors on the pattern's front! Black and turquoise to be exact! (Yep! That's what I thought!). When I look at these pictures now I just crack up! What was I thinking? Sweet little Adrie was a tiny Clown. Her tiny body was LOST in that outfit! 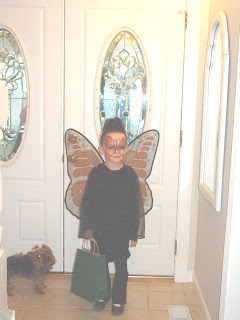 Over the years my children dressed up as many things! I'll spare you ALL the pictures and just show you a couple of my favs. Now...before you ask yourself "How did Rebecca come up with that little diddy?" Well...let me answer it really quick for you! The costume was once my dress. It was! It was a canary yellow dress with a gathered, very full, gored skirt. I wore it with a wide red belt and bright red earrings (say it isn't so...it was the 80's!). 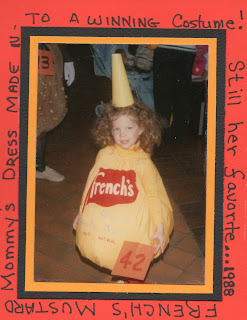 Anyway...I was always TRYING to come up with something special for my four year old and since the dress had lived past it's prime I decided to whack off the top and turn the base of the dress into French's Mustard Costume. I decided to enter Adrienne into a Costume Contest that was going on in OKCity at the time and she won 1st place and I got $100 bucks! :) Whooo Hooo! Three years ago I put the same costume on our Miss K! She was VERY SICK that year and was a real trooper for agreeing to get dressed up for her over zealous Nana! 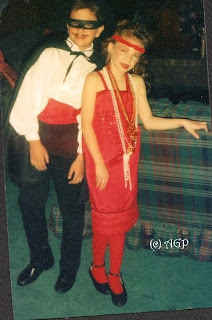 The year we bought our home, 1992, our son dressed up as Zorro and Adrienne was a Red Flapper. You can't see this in the picture but Bran had a huge black cape and he looked dashing with his 'lil mustache! Adrienne looks slightly intoxicated in this picture...but trust me, she wasn't! She was 8! (PS: Don't faint...but that carpet and couch use to be in my den!!!!). Thanks for taking a peek into our Halloween Memories. 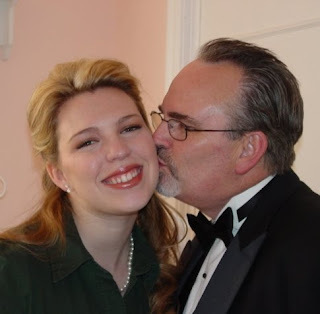 Later this week I'll share some pics of Miss K over the years...truly darling! 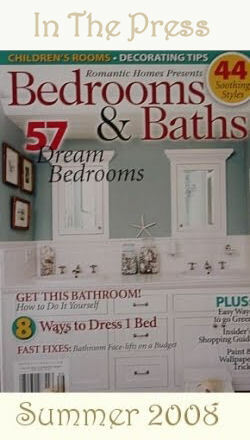 Want to know the upside of not having little kids in the home anymore? Every Halloween I'd dig for the good stuff (Reese's, Snickers, Kit Kat, etc.) and then systematically pack on the pounds eating it until it was gone. Now I make sure we give out ALL the candy we have...that way I'm not tempted in INDULGE! Just a quick note to let you all know that my Mr. AGPMan and I had the privilege of attending the Memorial Service today in Enid, Oklahoma, for Amy Ragan. 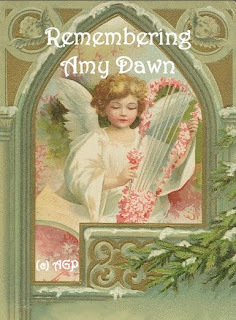 Amy is the daughter of Debbie @ There's An Angel On My Front Porch and the niece of Sherry @ Country Wings in Phoenix. 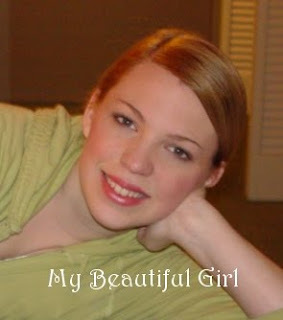 Many of you follow their beautiful Blogs and have known for quite some time of Amy's illness. For those of you who prayed for Amy's healing and were saddened by her passing, I want to share with you that she had a lovely service, one that celebrated her bright smile and joy of life. Beautiful music was sung and a heartfelt message presented by their Pastor. As a parent I've never considered the possibility of outliving either one of my children. I can only imagine what the next few days, weeks and months are going to be like for Amy's family as they learn to live without her earthly presence in their daily lives. I'm quite sure they would all greatly appreciate your continued prayers. Last December during my Grandmother's Memorial Service my lovely sister, Linda, sang the most beautiful song in honor of a woman who meant so much to all of her grandchildren. Although the song's words were written from the perspective of a mother whose child was leaving home for the first time, I believe the message behind the following lyrics will be perfectly understood. 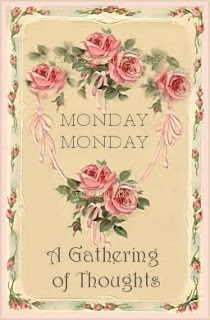 Happy Monday, Sweet Peeps! I hope this beautiful Fall Day has found you well! The year is certainly moving right along, isn't it? Over the past few years I don't recall ever being as busy as I am now! Not just in the business sense, mind you. Just BUSY in general! 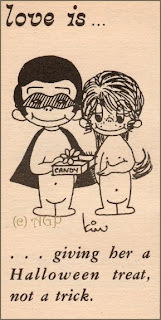 Typical stuff for my Mr. AGPMan and I! 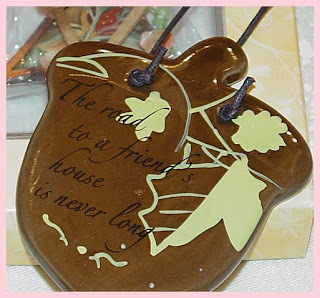 House renovation, family get-together time (lots of celebrations during the last half of the year), Christmas and Holiday shopping (we start early), selling hand painted and hand sewn pretties in my new Booth and online, and of COURSE, Blogging! I actually consider my busy schedule to be a good thing as the economy has hit all all pretty hard. I've never been one to turn down work because socking away money for a rainy days sure isn't as easy as it once was. 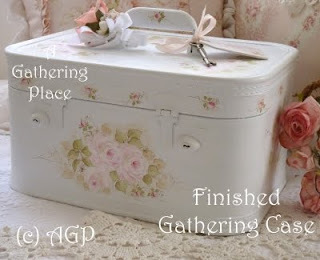 Over the past several weeks I've taken three special orders for refurbished "Gathering Cases" (Train Cases). I've decided to share with you the one you see above as it came to me because of BLOGGING! 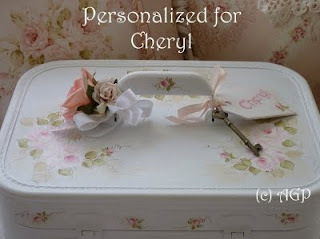 Made for a very special lady named Cheryl, I finished this Case about 10 days ago. But~ because of the gloomy Oklahoma weather it was in no hurry to cure!!! Today it was packed up and will soon be on it's way Canada! I'm so excited for my sweet blogging friend to get this truly special Case. Cheryl doesn't have a Blog as far as I know...she just FOLLOWS them! Thought I'd include a photo of the Case after I finished priming it! I only use Vintage Cases that are MADE OF WOOD! Truly they are the best of the best! 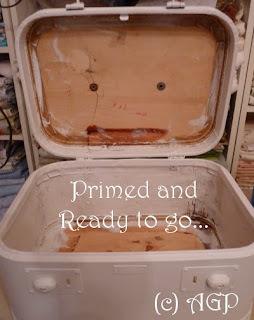 Before base painting your Train Case, remove all the old and yucky lining and start FRESH! Prime (PRIME! PRIME! PRIME!) with a bonding Primer (Remember...I told you about ZINSSER!!!!!!). Be careful when using latex paints that have added thickeners!!! I just discovered (ugh...the hard way) that SOMETIMES these paint additives will react with the rubber trim and cause the Case to remain tacky and/or sticky. Skip using Behr Paint AND KRYLON Spray Paint on your Train Cases! They will both leave you disappointed with the results. 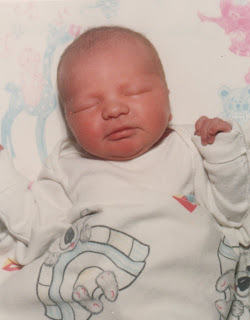 As hard as it is for me to believe, this very day you will turn 25 years old (at exactly 9:34 AM)! Where have the years gone? 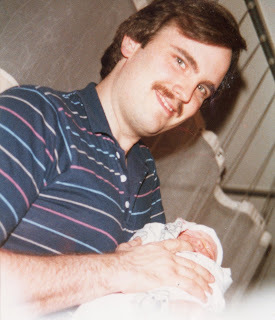 Seems like just yesterday your Daddy and I celebrated your exciting birth. 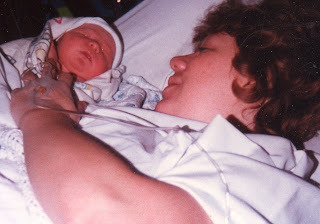 Knowing you would be our last child we were thrilled when the doctors told us we got our BABY GIRL! My little family was complete. Daddy, Me, Brandon and you. Beautiful, sweet, adorable YOU! You've been so loved by your family over the years! Especially by your brother (he'd do anything for you! 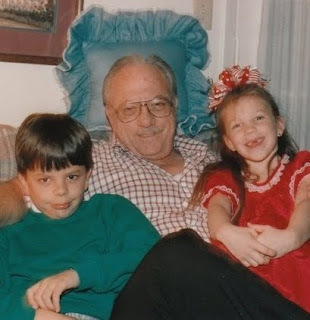 ), and your Grampa (I know you miss him). I especially love how you still make time for me even though you are all grown up! From the very beginning you made me feel special and needed. See our hands? And the sun is always bright. To the land I hold today. One that fadeth not away. For the glory of the cross. "Peace, Peace! Wonderful Peace! Coming down from the Father above. Sweep over my spirit forever I pray, in fathomless billows of love." 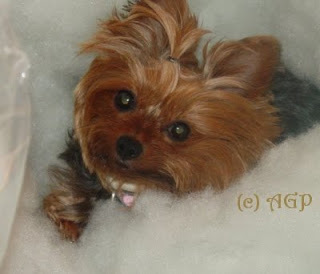 ~AND THE PINK SACHET PILLOW WINNER IS.....plus Three More! Good Morning, Sweet Peeps! OK...just how many times have you checked today for the WINNER of the Pink Sachet Pillow? 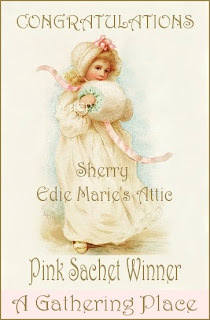 I am PLEASED to announce the lovely lady whose name was pulled out of the hat is SHERRY at Edie Marie's Attic! 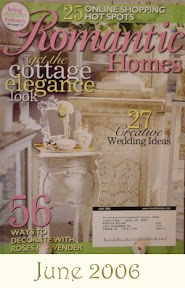 You must hop on over and visit this charming lady's beautiful Bloggie. She has a heart full of grace and I'm so excited for her that she won my October Giveaway! 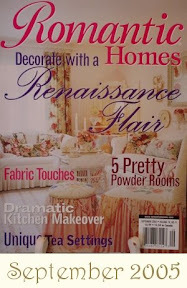 Sherry...please forward me your mailing address so I can get your precious little pillow off this weekend! Blessings to you...and thanks to all of you for your comments, visits to my Bloggie and/or posting about my Giveaway! Then you know from my FOLLOWERS LIST I was going to draw THREE MORE NAMES for additional prizes! The following beautiful Peeps will each be sent one of my Cookie Cutter Cards! Thank you so much for showing an interest in my work and for reading the endless thoughts and ramblings that sometimes pour out of my very full head! You bless me! Please email me with your mailing address so I can get your Cookie Cards off to you this weekend! Thanks to all of you who left comments, posted about my give-a-way, linked to my Site, shared your thoughts, your words of encouragement and love! OK, Peeps! 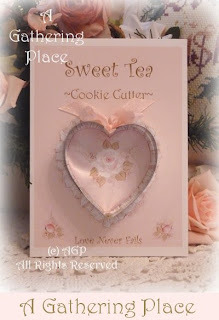 You asked for them and so I've finally uploaded my Sweet Pink Rose Cookie Cutter Cards on ETSY! Just click the link above and it will take you directly to my ETSY Shoppe! 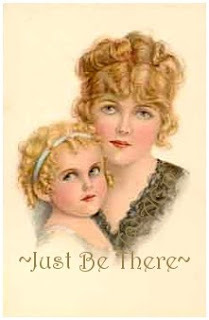 You'll be able to see up-close the inside of the cards as well as the sweet sentiments on the back. On the Card above it includes a charming little poem about a PINK CHRISTMAS TREE! If you'd rather not go that route and would rather just contact me directly you can email me HERE! 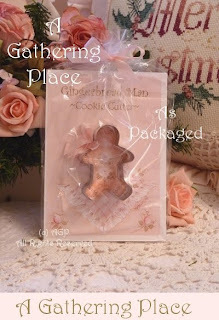 The Gingerbread Man Card also includes recipes on the inside and a sweet little diddy about Gingerbread Men and Christmas! The Heart Cookie Card includes recipes as well! On the back you'll find the scripture about LOVE (1st Corinthians)! 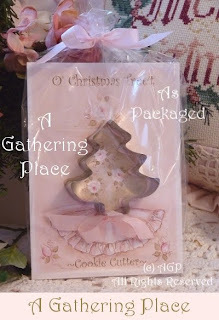 Thank you to ALL of you who have contacted me about these sweet Cookie Cutter Cards! I'm sooooo blessed by you! Honest I am! I'm jumping for JOY! I'm going to skip my "LOVE IS...and Other Things That Matter" today so I can show you the latest little pretties I've been working on for Christmas. 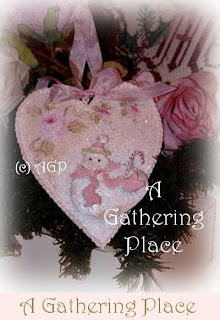 Lots of hand painted PINK ROSES and Snowmen! I've been consumed with getting orders filled and shipped for the Cookie Cutter Cards and haven't had much time to do other things! 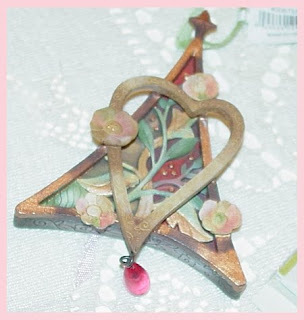 Earlier this year I found a FEW metal Christmas Ornaments just perfect for a REPAINT JOB. Yesterday I listed a few on eBay and they've all sold. Wanted to share a few pics with you just in case any of my Bloggie Friends want to hop on over and check them out later today. I'm planning on offering the last of the bunch this week. I sooo hope to find more... Stay tuned! I'll be working on getting individual pictures taken of the Cookie Cutter Cards today. For those of you who are interested they will be shown on my Blog later this week and HOPEFULLY uploaded to my website as well. Cost is $7.99 each. 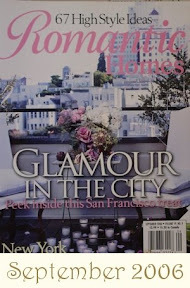 Special pricing available for those of you who have retail shoppes! The winner of the SACHET GIVEAWAY will be announced tomorrow! Just maybe your beautiful name will be chosen!!!!! My busy weekend is over and I've successfully laid out the plans for the next seven days. 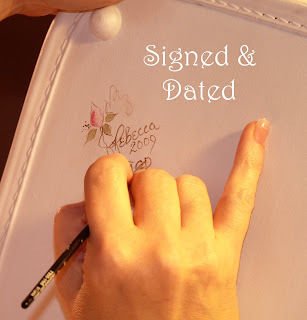 I have many things I want to share with you... lots of product orders to fill as well as exciting offerings for eBay to upload. Gosh...seems like I never stop! That's right. I don't! But, I LOVE IT! Did I ever tell you that I LOVE MY LIFE??? God is good! All the time! First some big news! 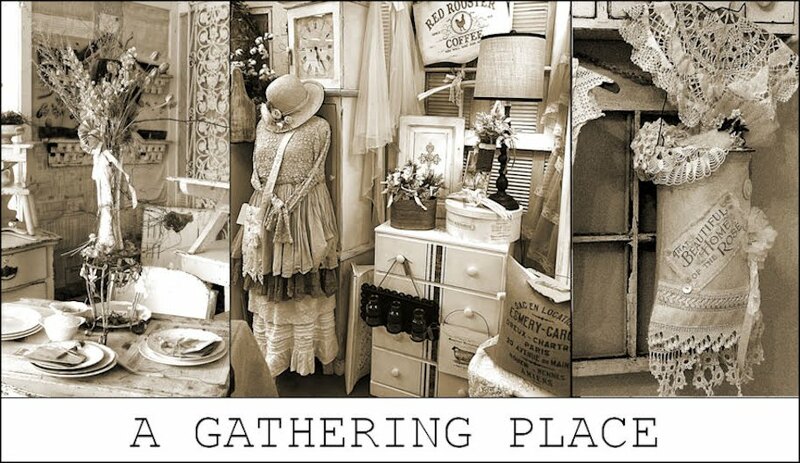 I opened a 100 Square Foot Booth in a local Antique Market here in Oklahoma City? I did. It's been a LABOR OF LOVE (and longtime coming). It's been over twelve years since I've had a 'physical space' in which to sell my wares. I'm about worn out from all the moving and hauling... Time will tell how much I continue to LOVE IT! More news and some pictures about this soon. I might also add...I will be carrying the Cookie Cards on Etsy later this week and eventually on my Website! If you'd like to order them just EMAIL ME! Special pricing on Wholesale Orders, too! 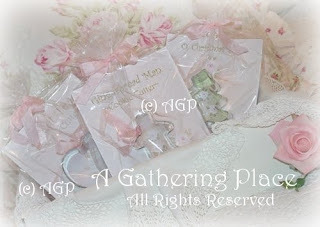 These sweet little pretties are great for FAVORS and Teacher Gifts, etc.! Don't forget about the DRAWING for the Sachet Pillow! The winner will be announced later this week! Make your comment, follow along, post the link, upload my button, etc. for a chance to win something for FREE! Yesterday as I sat next to my aging Father and tried desperately to carry on a conversation with him I felt my face grow hot and my heart start to panic. In all the times I’ve visited him over the years, from the very beginning of his Alzheimer’s/Dementia diagnosis and his Nursing Home INCARCERATION, he’s never ever not known me. He's not known other people, but never NOT ME. I want my Dad to get well. That is what I’ve been asking from God, and anything less has been unacceptable. I’ve prayed for such a long time for healing to come and for the TORMENTOR that has invaded his mind to find a new home. Still, the intruder has stayed on. This un-welcomed visitor has now taken up permanent residency inside my Father’s brain and he refuses to go. “This isn’t LIVING! !” I thought to myself. Truthfully I wanted to curse. I really did. But…there isn’t a vile enough word in the English language that can describe how it feels to stand along the sidelines and watch helplessly as a once vibrant mind turns into nothing more than a blank stare. After almost an hour of soft smiles and sporadic conversation, I grabbed my purse and bent down to kiss the forehead of my restless Father. “I love you, too!" he added. And for that tiny moment, that memory was enough. In case you need a little push (I pray you DO NOT! 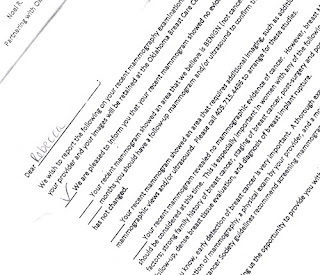 ), please, please, PLEASE schedule your yearly Mammogram today! And...if you don't do month Self Breast Exams each and every month then I BEG YOU to begin that today as well! Doing this one tiny little thing each and every month could very well save your life. Truthfully...I hate the entire process. I hate doing the self-checking thing. It's scary and I struggle to know exactly what it IS I'm looking for. Still...I know my body and I trust my own instincts to notice something that isn't right. AND...just in case I miss something (which is POSSIBLE! ), I go every single September for my yearly Mammogram. I go because I love my husband! I go because I love my children! I go because I love myself! As you can see below I was thankful and blessed to receive a good report again this year. Thank you, God. At present I have five (YES FIVE!) friends that are dealing with Breast Cancer. 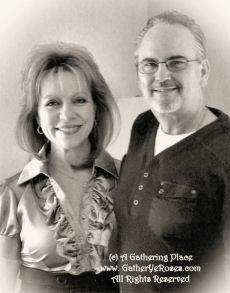 All are in one stage of treatment or another and I'm thrilled to say my sweet friend, Judy the Beauty, is cancer free. Two more are doing fabulous, one is struggling and one is truly suffering. Want to know how four of the five found their cancer? Self Breast Exams! Beautiful Judy(she's really gorgeous - outside & inside!) had a Mammogram and they missed it! After successful chemo and a long recovery, she is doing great now. Thank you AGAIN, God! May God be with all of you who are either dealing with cancer or are close to someone who is. I'm sure ALL of us know SOMEONE whose life has been changed by this disease and it is my continued prayer that we will all see it wiped out in our lifetime. PS: If you are a MAN and you follow my humble bloggie I encourage you to support the women in your life, be it your Mother, Sister, Wife, Lover, Daughter or Friend... It's quite possible your loving support and encouragement could help save their very life! I got up extra early this morning so I could finish the pillows I started yesterday for both my Shoppe and eBay. I had just stitched up the last of four when I realized I'd used the last of my PolyFil the day before. Now...I buy Fiber Filling in large 10lb boxes (that is a lot of Fill!). If you aren't careful when you open up the inner bag it sometimes spills all over the place... and, that is exactly what happened. As a result about 3/4 of the Fill stayed inside the plastic bag and the rest made it's way onto the floor. Ugh! 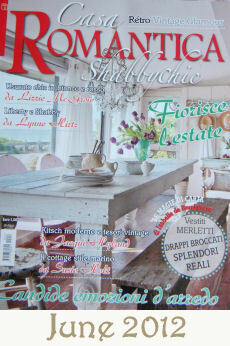 Would you like to know what I found when I walked inside? 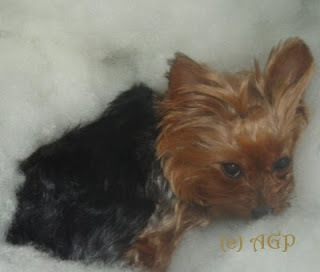 Miss Mollie the Molinator (my 4lb Yorkie) had found a new resting place! A very comfortable one, I suspect. When she saw me she immediately turned her head away so I couldn't see her shame (trust me when I tell you she KNOWS BETTER!). "MoMo! What are you doing in my Stuffing?" I scolded! "Um...I"m just laying here Momma! I'm bein' good and it's soooooo comfy! Please don't make me move!!!" I know this is sick, but want to know what I did next? I picked MoMo up, Fiber Filling and all, and placed them on top of her own little bed. 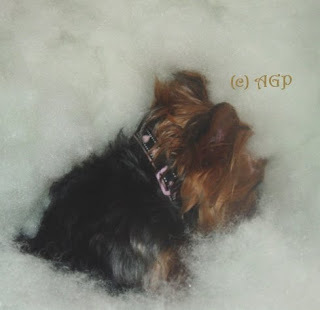 That was 3 hours ago and she is still there, quietly sleeping on a cloud of white fluff. 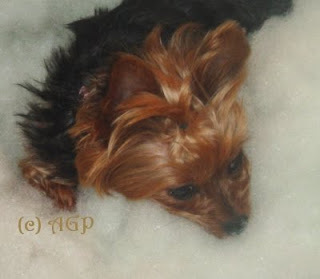 The life of this dearly loved pooch is sometimes greatly envied by her owner. Of all the paintings done by the dearly loved Maud Humphrey, this tiny little girl with the roses in her bonnet remains my favorite. I just love the innocent look on her face...something about her cherubic smile makes me feel warm and cozy all over. 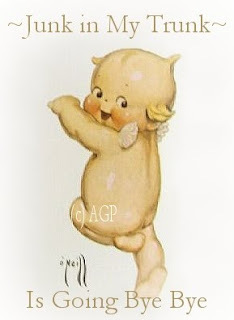 Offered up for my October Give-A-Way is a darling Sachet Pillow made using this reproduced image of Ms. Humphrey's work. 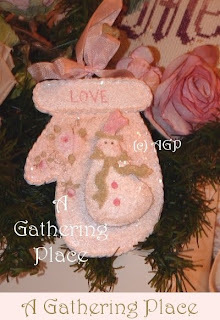 The Sachet was made with old rayon damask in pink and has a white on white floral ruffle. 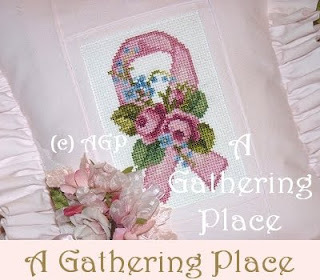 It comes accented with vintage Venice Lace threaded with vintage pink rayon satin ribbon. I do believe this is my 6th or 7th Pillow made using this precious little girl as the center. Hope you will all love her as much as I do. Tucked inside the Sachet you'll find a generous 1/2 cup of 100% pure lavender buds. 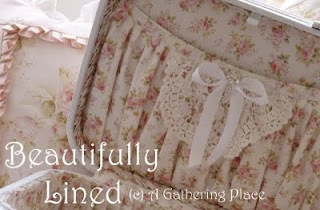 It smells divine and measures just about 10" x 10" including the ruffle. Here are the guidelines for having your little name entered into the drawing for FREE! It's simple and there are several ways to get your name thrown into the hat MORE THAN ONCE! DRAWING WILL BE HELD ON OR ABOUT MIDNIGHT ON OCTOBER 21st. The WINNER will be announced sometime on OCTOBER 22nd. Happy Entering and I hope you have fun! 1. If you FOLLOW my Bloggie you are automatically entered once! 2. Leave a comment on any Post from now until 9pm on October 21st and you'll be entered again. 3. 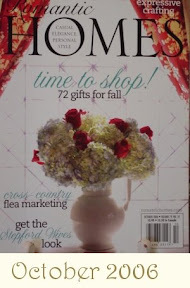 Link to my GIVEAWAY from your Blog and I'll enter your name again (you must let me know). 4. Post my BUTTON on your Blog and I'll enter your name again (again, you must let me know). You'll have four chances to get your name in for the drawing for the Sachet Pillow! Let me know if you have any questions, K? Good Morning, Peeps! I hope this beautiful Tuesday finds you all happy and doing well! I've been sewing up a storm and finishing up two very special (and large) orders that have kept me burning the midnight oil around here! I've had just enough time to SQUEEZE IN a couple of extra hours to finish up my October Giveaway which will begin tomorrow. I hope you'll stop back by to see what I have in store for you! I'm so excited and I hope you are too. 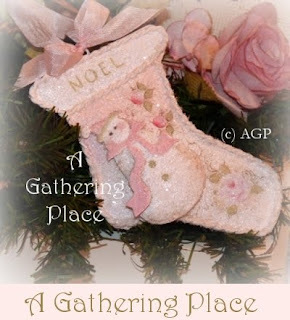 Last month for the PINK CHRISTMAS STOCKING GIVEAWAY I had several hundred entries to toss into the HAT. It took me quite a bit of time to wade through them all before pulling out the winning name! I hope this next FREE DRAWING will bring you as much excitement. 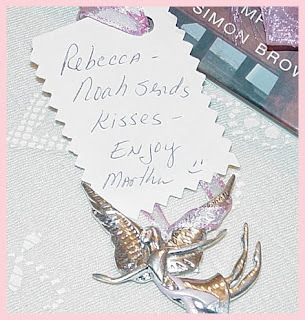 So...I was especially excited to win the sweetest giveaway by the ever lovely Miss Martha from Martha's Favorites! 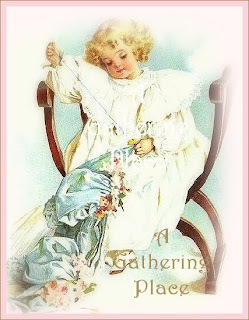 I love to wander through this delightfully sweet lady's Blog. 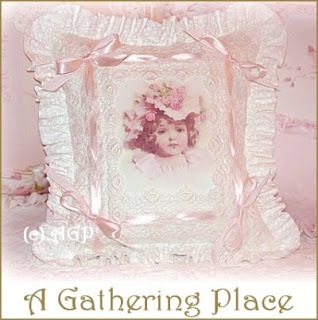 She shares her love of collecting and also stories of her family and faith. 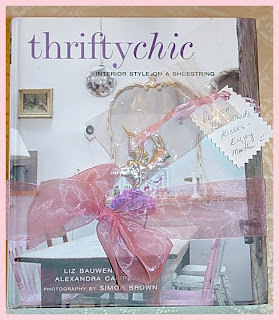 I'm sooo excited to share with you the fabulous THRIFTY CHIC BOOK she sent me! I absolutely love it! It came all wrapped up in a pretty pink organza bow with the sweeeeeetest note saying "...Noah sends kisses..."
I'll be perusing through this Book over and over and over and over...it's wonderful! 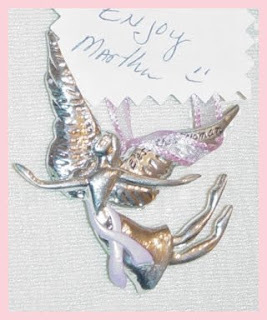 And...to make the win even better Martha also sent me this amazing little Angel Ornament! I've enlarged her below so you could see the details! Now...my next win came from Miss Sherry from Country Wings in Phoenix! Sherry has an amazing Blog that both uplifts and inspires. Presently she is carrying a huge burden for her sister, Debbie, and her sweet niece, Miss Amy, who is very ill. How in the world she managed to get this little box of goodies off to me is beyond me! 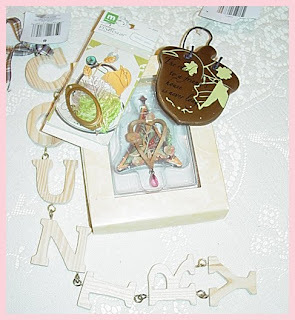 Tucked inside a simple little box I found an array of lovely treasures. Sweet Hanging Letters that spell out COUNTRY (which of course will always make me think of Sherry's love of Country), a darling Acorn Hanger to remind me that "The road to the house of a friend is never long"...(I love this), a tiny packet of scrapbook paraphernalia (great for my Brandon, Adrienne and Miss K projects), and last but not least a fabulous Christmas Tree Ornament showcasing a beautiful heart and dropped crystal. Thank you, SherryGirl! I want you to know you've blessed me more than I can say! I know you are in Oklahoma right now and I'm so hoping before you return to Phoenix we can meet up for lunch...my treat! Thank you again to both of these beautiful Blog Lovin' Gals. I'm honored to know you both...more honored to call you both friend. God is good! All the time!